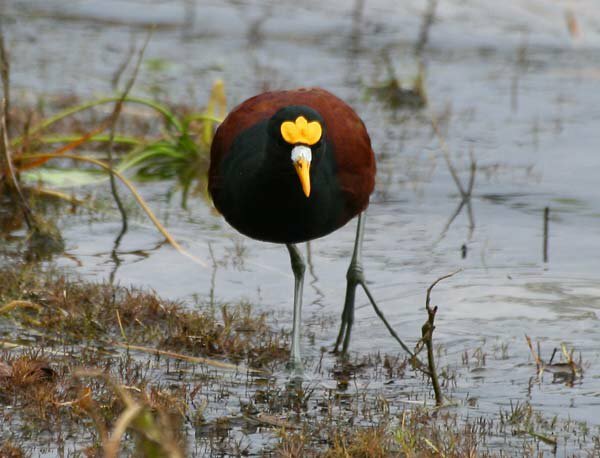 Pedantry loves company, so I was glad to see Julie Zickefoose setting the record straight on how to pronounce “jacana.” In the world of bird-naming mistakes, this one seems relatively minor, but it’s a headache for those of us lucky enough to travel in the Neotropics. Having to explain yourself every time you use the original pronunciation is the pits, so I resolved for last month’s Belize tour that I would finally give up trying to pronounce it correctly. It would be “ja-KAH-nah” for my group, “ha-KAH-nah” for Spanish-speaking acquaintances. It didn’t work out that way. The Brazilian pronunciation kept slipping out, and I sounded like a complete idiot trying to change it in mid-word to the Anglicized or Spanglicized versions (“Look, there’s another Zha… Ha… Jah…”). It’s not like Northern Jaçanas are rare in Belize, either. They’re thick around slow-moving fresh water, especially as the dry season shrinks the lagoons. After a couple of days around Crooked Tree Sanctuary, I was dying to get into the forested uplands just to get away from having to pronounce that name. No luck there, either. A living room-sized puddle along the road out of our upland lodge had a resident juvenile, so we saw at least one almost every day for the first week of the trip. There’s an alternative that I wish would catch on: lily-trotter. Sure, it’s a little silly, but it’s in use in Africa (where a Tupi word seems out of place), every English speaker will know instantly how to pronounce it, and it fits so nicely with all the other hyphenated bird names in the tropics. Northern Lily-trotter. On my next Belize trip, that’s what I’m calling them. No more “Zha… Ha… Jah….” Seriously.